Bye bye royal Range Rovers. High-end luxury car manufacturers like Bentley and Rolls Royce like to claim that their cars can make any owner feel like royalty. But how often do you get to actually own a car that was driven, ahem, ridden in by royalty? 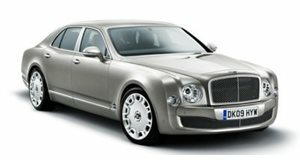 If you have a paltry sum of $285,000, then you can own the very same Bentley Mulsanne that was bought and owned by HM Queen Elizabeth II. Not only is this the best way to brag your way out of having friends, it is also one of the coolest uses of Auto Trader’s website to date. This 2012 model with a 6.75-liter V8 has depreciated by $20,000 despite only having 5,826 miles on the clock. This isn’t much traveling for such a slick car like this, but the reason for that may be the lack of armoring that this Bentley has when compared to the two $1.4 million dollar Bentley limousine tanks that crowd her garage. Right before delivering the Bentley to Bramley Motor Cars, the dealership selling the Bentley, it was stripped of police lighting, police communications, and the royal coat of arms. We’re unsure exactly why the Queen wanted to get rid of what is otherwise a brand new Mulsanne, but it could be because she has been bitten by the luxury SUV bug and wants to make room for her new Bentayga SUV.